Limit simultaneous calls for a customer. In today’s business climate, securing customers’ balances and ensuring that the customers only use the service when they have sufficient funds is essential. Overdraft protection functionality helps you reach this goal. For a detailed description of overdraft protection functionality, please refer to the PortaBilling® Administrator Guide. By default, the system operates in overdraft protection mode. This means that every session is authorized based on the total amount of customer’s available funds, thereby restricting the number of concurrent sessions to one. This works well for prepaid services such as calling cards, where a user makes a single call at a time. This chapter describes the overdraft protection configuration for postpaid services, which entail establishing several simultaneous sessions for a customer. This is the most flexible overdraft protection configuration since the customer’s funds are locked “on the go,” and can update a session or initiate another concurrent one. Dynamic re-authorization is fully supported by PortaSIP®, allowing your customers to initiate several concurrent sessions and protect their balance from overdraft. Note that since PortaSIP® sends multiple re-authorization requests to PortaBilling®, this might impose additional load on the system. John Doe is your residential customer. He has 2 phone numbers, one for himself and one for his wife Jane and he has subscribed to A-Z calls for a unified price of $1 /min. He has $10 of available funds and may make a maximum of two concurrent calls. To prevent overdraft, you configure PortaBilling® to allocate $3 for each session and re-authorize it for $3. 1. On the Configuration server web interface, clone the existing configuration to modify it. 2. From the Configuration tree select ClusterSuite ->PortaSIP Cluster -><your_sip-cluster>MUB2bua group and set Yes for the allow_reauth option. 1. On the Edit Product panel, click Charges and select Usage charges. 2. 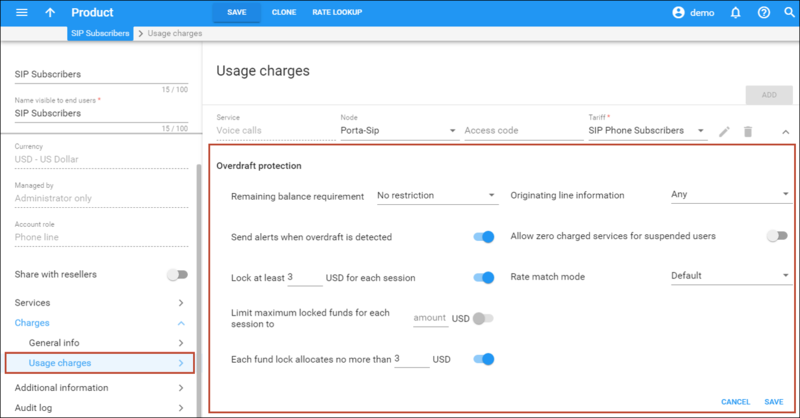 On the Usage charges panel, click the button to configure the Overdraft protection. · Enable the Send alerts when overdraft is detected check box to receive notifications in case of overdraft. · Specify 3.00000 for the Lock at least … for each session option. · Specify 3.00000 for the Each fund lock allocates no more than option. PortaBilling® allocates $3 for this call and computes the call duration at 3 minutes. The amount of available funds is $7. After 2 minutes, his wife Jane makes a second call. PortaBilling® analyzes the amount of funds available ($7) and allocates $3 for this call to last 3 minutes. The amount of available funds remaining is $4. John is still on the phone, therefore PortaSIP® re-authorizes the call in PortaBilling®. PortaBilling® allocates $3 for another 3 minutes from the amount of available funds ($4) leaving $1 available. When PortaSIP® sends the re-authorization request for Jane’s call, PortaBilling® locks the remaining $1 of available funds and computes the call duration at only 1 minute. Since no more funds are available, John is disconnected 6 minutes after his call initiated while Jane is disconnected after 4 minutes of making her call. PortaBilling® produces two xDRs for these calls, for $6 and $4, respectively. If your gateway is not capable of dynamic re-authorization, you must disable the overdraft protection to be able to establish simultaneous sessions. 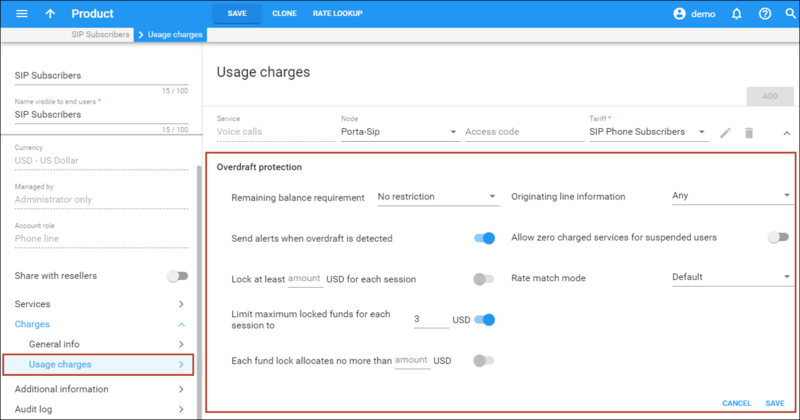 Although this could open up the possibility of overdrafts (since each session will be authorized based on the total amount of customer’s funds), you can diminish that by configuring PortaBilling® to lock the optimal amount of customer’s funds for a session. You are the IP Centrex solution provider. A small company, Easy Call, is your postpaid customer. Their staff consists of only three people; therefore, they need to be able to make simultaneous calls. Their credit limit is $10. To secure the customer’s balance, you limit the number of simultaneous calls to 3 and configure the maximum amount of locked funds to $3 for every call. In order to limit simultaneous calls, configure PortaSIP® to send accounting requests to PortaBilling® when a call is connected. 2. From the Configuration tree select ClusterSuite ->PortaSIP Cluster -><your_sip-cluster>MUB2bua group and set Yes for the send_start_acct option. 3. Verify the new configuration and click the Check / Apply button..
· Specify 3.00000 for the Limit maximum locked funds for each session to option. 2. Use the Customer search panel to search for the desired customer, e.g. EasyCall. 4. On the Customer panel, click Services and select Voice calls. 5. 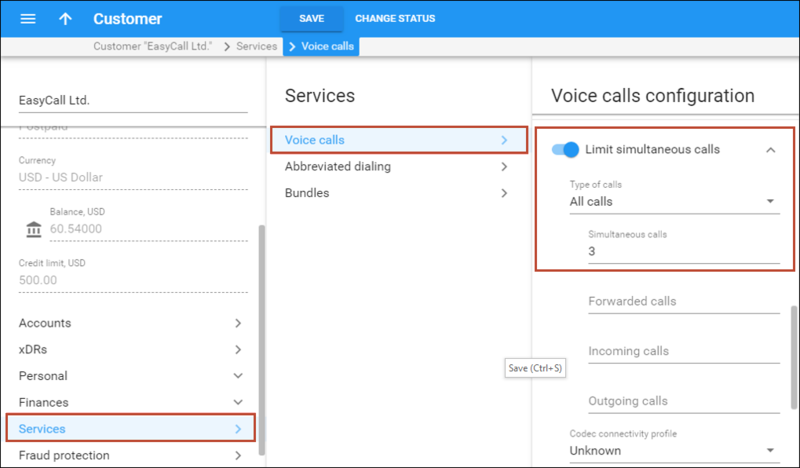 On the Voice calls configuration panel, enable the Limit simultaneous calls option. 6. Specify the maximum number of simultaneous calls allowed. This allows you to limit the number of concurrent calls for this customer’s accounts. · When the first call starts, PortaBilling® allocates $3 and computes the call duration based on total funds available ($10). · When the second call begins, PortaBilling® analyzes the customer’s funds. There is a $7 balance, since $3 became locked for the first call. PortaBilling® allocates $3 and computes the call duration based on the remaining funds ($7). · When the third call is initiated, PortaBilling® allocates $3 to authorize it but computes the call duration based on the $4 remaining.